Many supermarkets support charities by making donations, providing volunteers, letting people fundraise in-store and even making us their charity of the year! If you get the chance to do a bag pack or hold a stall in-store, get in touch! Waitrose and Asda run two great schemes to donate to local charities. You can help support the Child Brain Injury Trust and raise money for the charity simply by nominating us to receive support from your local branch of these stores. Please read through the info below to find out how you can help. Every year Sainsbury’s stores across the UK partner with local charities and raise millions of pounds. The selected charities will benefit from a year-long link with their local store, with staff getting involved with fundraising events and volunteering for the charity. Nominations can be made between 1st and 15th May every year. In your own words, the reason you are nominating us. Sainsbury’s is looking to help vulnerable people in their own communities. They will be interested to hear your own reasons for supporting our Charity in your local area, and of any links to hearing loss you may have. The reason you are nominating us and simply post instore! Please hurry, nominations close on Wednesday 15 May. Every nomination really does make a difference, so the more Sainsbury’s stores we can reach, the more opportunities we have to benefit. Please pass on this email to friends and family so that they can vote too. 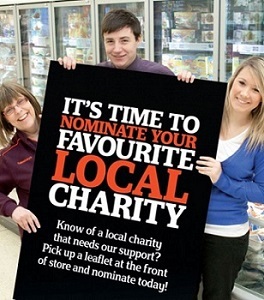 Their Community Champion will then draw up a shortlist from all nominations submitted, and representatives from the shortlisted charities will be asked to visit the store to talk to colleagues about what they do and how the Sainsbury’s team could support them. Calling into your local store and introducing the Child Brain Injury Trust to their Community Champion. Let them know about the charity and why the store should support you. The more personal and emotive nominations the branch gets, the more likely the store is to take notice of you and put you on the shortlist. Does anyone have a connection with the store? Such personal links can really help. If we are shortlisted, your local Fundraiser will be happy to help you prepare to present to the store about why we should be chosen. You can read more about the Sainsbury’s Charity scheme here. 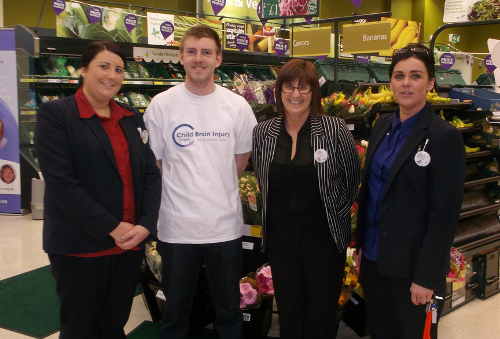 Every month three good causes receive a share of £1,000 from their local store as part of this initiative. The charities and community groups are selected by nominations from customers and Waitrose employees, so please be sure to nominate the Child Brain Injury Trust in your local store! You can do this by printing off the nomination form or picking one up from the Customer Services desk in store. Complete the details then hand back to Customer Services. The form is very brief, and will take just a couple of minutes to complete. What does it do: Your own short description of what we do and why it is important to you, or write something like this: I am nominating the Child Brain Injury Trust as they support children with brain injuries, their families, siblings and school teachers. They’re a fantastic charity who help hundreds of families each year come to terms with life after brain injury. 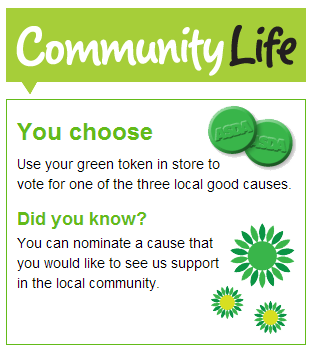 Customers shopping in the store are given a green token in which they can vote for which of that month’s three charities they want to receive the donation by placing the token in one of three Perspex tubes. At the end of the month the cash is divided up in proportion to the number of tokens a charity has received. So make sure you pop your token in the Child Brain Injury Tube if you see we’ve been selected! 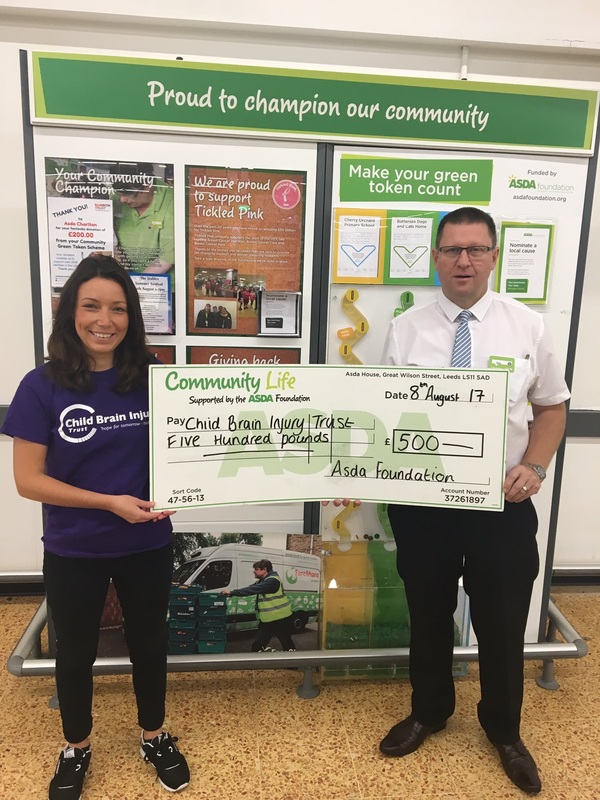 ASDA’s programme is designed to raise awareness and funds for local charities. Every 2 months each ASDA supermarket makes a donation to 3 charities nominated by shoppers and awards £25, £50 or £100 to each of them. Each time they make a purchase shoppers are given a token at the checkout plus an extra token if they use the store’s bags for life. 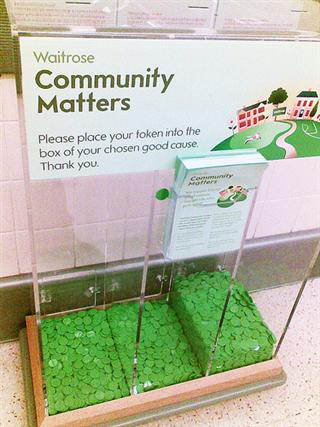 Tokens are then used by shoppers to vote for one of 3 nominated charities. The charity that receives the most votes receives £100. To nominate the Child Brain Injury Trust is really easy. Just follow this link to the ASDA website and locate your local store. Once you’ve clicked on your local stores own page you’ll see the Community Life info on the right of the page, click on the blue ‘Nominate’ button. This will take you to a simple form which takes just a minute to fill in. When completing the nomination form, please write a short description of what we do and why it is important to you, or write something like this: I am nominating the Child Brain Injury Trust as they support children with brain injuries, their families, siblings and school teachers. They’re a fantastic charity who help hundreds of families each year come to terms with life after brain injury.